Learn what odds of roulette are, why they are important, how to calculate and choose them in a proper way. Although roulette is usually considered as rather primitive game where human factor does not matter a lot and everything is as simple as possible but there is still some confusion concerning calculating odds of roulette. To make it clear, let us assume that you stake £1 on some number and it appears that you have a right guess and win. Thus, your potential payoff is £35 but the probability that you will actually win it is just 1/37 in European game and even smaller - 1/38 - in American version. Keeping in mind that you also have your initial investment of £1, let calculate the true value of odds: £37 - £35 - £1 = £1 stands for European/French roulette odds and £38 - £35 - £1 = £2 - for American roulette odds. So, there is a gap between your real winnings and the amount that you will be paid by casino, which is actually called odds of roulette. If one converts these numbers into percentage form they will get 2.703% house edge for European roulette and 5.263% for American one. This means that if a gambler plays roulette for significant time and spends, for instance, about £10 000, then he or she loses approximately £270 or £526 due to odds of roulette. Roulette could be considered as a game luck, of course, but casinos add some stable element in it that does not depend on a chance at all: they just get their odds despite of game's outcomes. 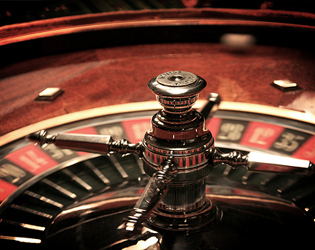 However, there are some conditions and tips that could suggest players some ways how to beat roulette. For the sake of justice, it is worth to mention that some casinos offer additional options in order to decrease their odds and, in such way, attract gamblers. Per se, all these rules are aimed to soften players' losses in case of their failure. The surrender rule (the 'La Partage' rule) is valid only in case of outside stakes (red/black bets, odd/even bets, high/low bets, dozen and column bets) which pay out even money. The rule claims that if roulette ball lands in single zero or double zero pockets, players lose only the half of their initial bet, not the whole amount. This condition is usually used only in American roulette and decreases the house edge down to 2.63%. The 'En Prison' rule is also applicable only for even-money stakes in case of outside betting. Here, if roulette balls hits zero positions, players again lose only the half of their original bet, but they also have a right to either continue playing or take the rest of the chips back and stop. Such option is sometimes used in European roulette also and decreases the house edge till 1.35% (2.63% in American one).